The wives of Police Wives of America are excited to share information about a special project that weâ€™ve been preparing for several months. When tragedy strikes and a spouse is lost in the line of duty, it has been our desire to do something tangible for our blue sisters and brothers. Silver pendants will be engraved with a simple message; â€œ(widows name), Sisters forever by your side. â™¡ PWOAâ€� with the fallen Officerâ€™s badge number. 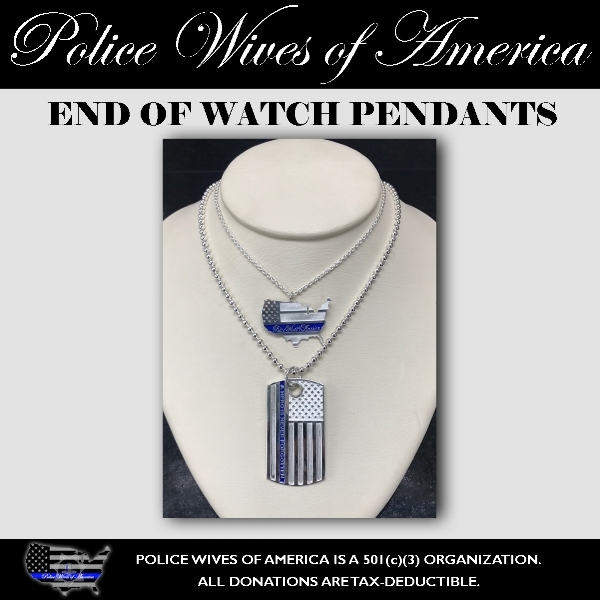 With the amazing help of Officer Daniel's & Mike the Cop from Humanizing the Badge, we have been able to raise enough funds to cover all the pendants for 2017. As of March 2018, we have lost 17 officers in the line of duty. This project will be ongoing as long as it is funded by your generous contributions. Thank you for all of your continued support! And a HUGE THANK YOU to The Jewelers of Las Vegas for helping us make this happen! Please click on the image above to donate!